← Searching – 80’s PLAYMATES PIXIE LULLABYE DOLLY -12 inch RED HAIR DOLL with a SOFT BLUE BODY – Pull String MUSIC!!! 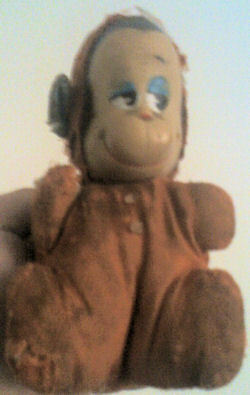 I am looking for a monkey originally purchased in 1968/1969. He is made of a reddish orange velveteen cloth, with blue velveteen in the ears. The one in the photo has been well loved, and all the velveteen has been worn off. He has a rubber painted face and is about 6 inches in size. I am looking to replace my mother’s beloved stuffed monkey she named “Willie”. It was given to her by my father before my birth and was always part of the family. I still have him, but he is falling apart badly. I would like to find a copy or 2 to give to my brother and sister, so we can all have a reminder of our “older brother” my mother dearly loved.